Two weeks ago, office cleaners at WeWork locations throughout New York City began protesting unjust working conditions. WeWork is an international co-working startup recently valued at ten billion dollars that is based in New York, where it is, by footprint, reportedly the fastest growing company in the city. The janitorial staff at WeWork’s New York locations are demanding higher wages, benefits, and vacation time; they are also considering joining a union. 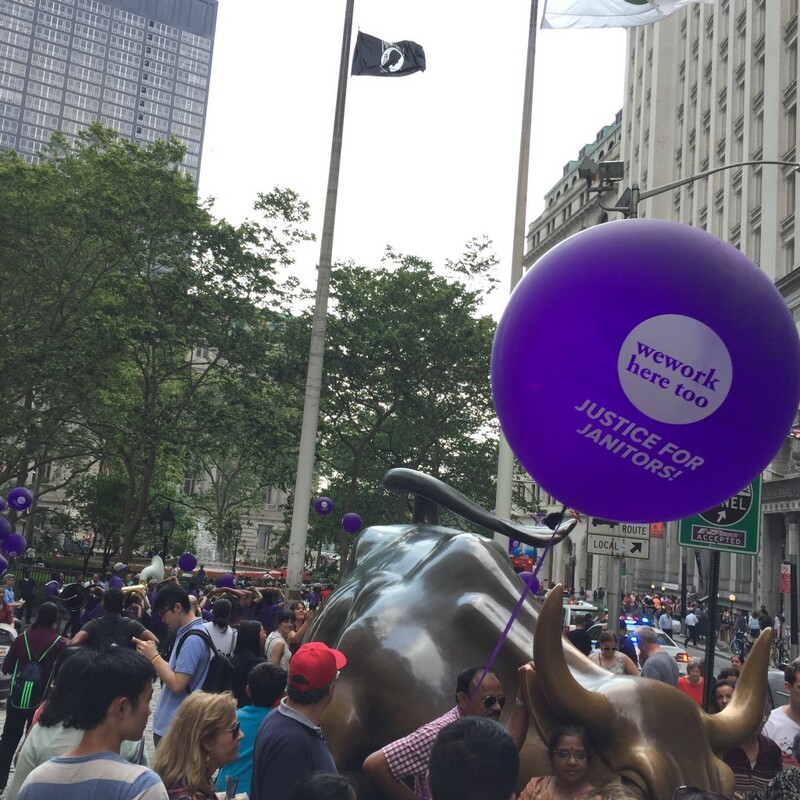 On Wednesday, they, along with sympathetic union workers from 32BJ (the local chapter of the national Service Employees International Union), and a drum and bugle corps marched from one WeWork location, at 222 Broadway, near Fulton Center, to another, at the Charging Bull, in Bowling Green Park. Speeches were made; the band played; confused tourists looked on. WeWork cleaners are not employed by the company, but by the Commercial Building Maintenance Corp., which is a non-union shop. They make eleven dollars an hour or less, without benefits; the prevailing wage in New York for union workers is twenty-three dollars an hour, with full benefits. According to 32BJ, ninety percent of commercial office cleaners in New York City — and ninety-eight percent in Manhattan — are unionized. Union members from 32BJ — which claims to be the country’s largest property service workers union, with a hundred and forty-five thousand members, including seventy thousand in New York City — leafleted outside WeWork locations in Boston, Washington, D.C., and Miami, where WeWork just opened. If CBM’s cleaners vote to unionize, they will likely join 32BJ. “Everybody wants to join the union,” Bolivar, a WeWork cleaner, told me. Bolivar works the night shift at the WeWork space at 120 East 23rd Street. He and two other cleaners have five hours to clean the two kitchens, take out the garbage, mop the hallways, and dry mop the cubicle and office spaces. “We can’t do everything they want us to do,” he said. CBM also expects its employees to cover for absent co-workers whenever and wherever necessary, without paying overtime. “They love to add more work,” he said. For Bolivar, the organization effort is not only about fair compensation, “It’s respect that I would like.” Nobody inside WeWork has said anything to him about the union drive. “It’s business as usual,” Bolivar said. Not only is CBM the contractor in all of WeWork’s New York locations, but, according to Cohen, CBM doesn’t have any other cleaning contracts with commercial office spaces in New York City. If CBM agrees to start paying their cleaners at the union rate, those charges would get passed up to WeWork; essentially, WeWork chooses whether or not to pay the union rate. CBM does not employ unionized cleaners. However, one CBM cleaner told me that he’d heard the company’s owner also owns another company that does work with unions. There may be something to this: CBM is headquartered at 200 Oak Drive, #201, Syosset, NY; so is a company called Spanier Building Maintenance. It, unlike CBM, does employ unionized workers. 32BJ, meanwhile, says that it will not stand for WeWork pulling their contract with CBM in New York, regardless of whether it switched to a different, union contractor. “We would not accept any agreement that would not include the continued employment of the cleaners that are there now,” Cohen said. Neither CBM nor SBM responded to requests for comment; WeWork declined to comment. In one respect, the insidious brilliance of WeWork is the ease with which it capitalizes on the erosion of any meaningful distinction between work and life and how, through the marketing platitudes and hashtag banalities that sell its members — known elsewhere as tenants — on proximity to a culture of entrepreneurship, it further erodes that distinction. Adam Neumann’s vision for WeWork is not just to create a startup incubator disguised as a series of coworking spaces. “We are not competing with other co-working spaces,” he told Bloomberg. “We are competing with offices. And that is a $15 trillion asset class in the U.S.” Apartments too: WeWork is reportedly exploring a concept called WeLive, wherein WeWork members will live and work in the same WeWork-owned spaces.